I print for the joy of discovery. Each choice I make of materials, tools and techniques guides the next, and the story of each original work on paper reveals itself as the piece and I go along in the process. My art is often inspired by my travels. I am especially attracted to the textures, shapes and colors of a place, and I capture these in photographs and sketches. Back in my studio, I work with these images as I use various techniques to create each print. I am not interested in creating a travel journal with my work, but rather to let all the varied impressions of a trip bubble up into some expressions of feeling or emotion that may go beyond anything specifically related to a given locale. I work intuitively. 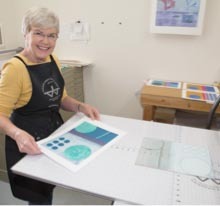 Once I begin a piece, I am influenced by shapes and colors playing with and against each other and the simple pleasure of making marks on the printing plate. My work has been shown in art exhibits around the United States and is in private collections in California, Oregon and Washington. I have a studio in the BallardWorks building at 2856 NW Market Street in Seattle, Studio 2B - 2E. There are many other artists in the building as well and we open our studios to the public for the Ballard ARTwalk, the second Saturday of each month, 6pm  9pm.  NW Collage Society Members¹ Summer Exhibit. Juror: Donna Watson.